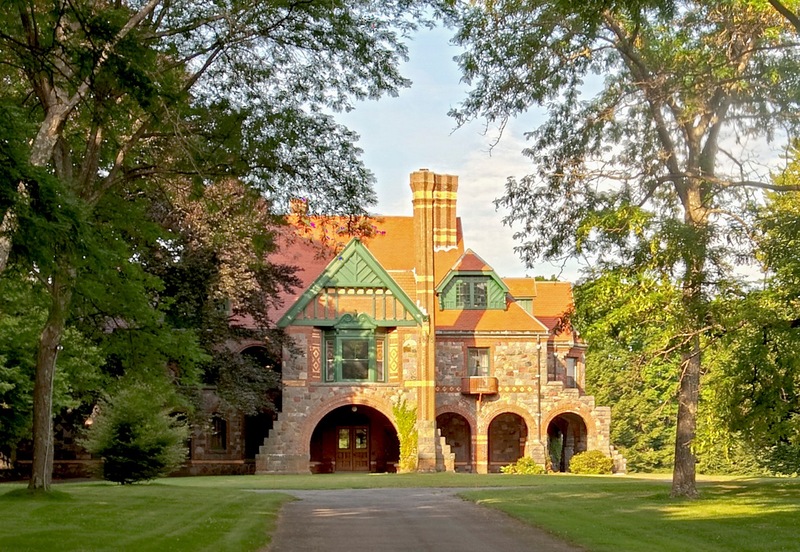 Welcome to the Eustis Estate, home to W.E.C and Edith Eustis and their young family. The property comprises eighty acres of fields, woodland, and gardens with four original buildings built between 1878 and 1902. The land was a gift to Edith Eustis from her mother, Mary Hemenway, on the occasion of Edith’s marriage in 1876. 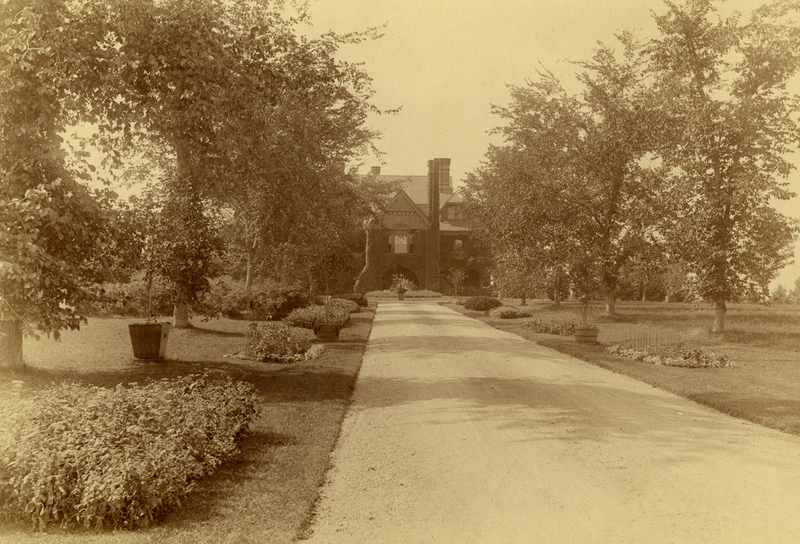 Mrs. Hemenway owned the large estate to the south of this site, and W.E.C. Eustis’s family lived to the north. 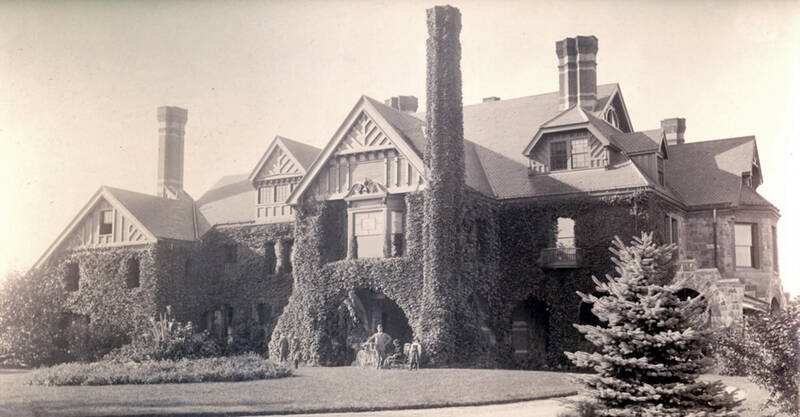 The mansion was the first building constructed on the property in 1878, and was designed by preeminent architect William Ralph Emerson. Enjoy walking around the estate from dawn to dusk. Please respect our neighbors’ privacy and refrain from walking in areas that are marked as private. Each elevation of the Eustis mansion is testament to Emerson’s talent in designing a complex and impressive architectural composition. The stone and brick mansion is heavily patterned, which is typical of the Queen Anne Revival style. Every view of the building offers an unexpected treat. During your visit, be sure to walk completely around the house and see how each side is unique. Many of the architectural details were covered with ivy starting in the 1890s, but in the mid-twentieth century the ivy was removed to reveal the decorative stone and brickwork. The view out the front door looks down an allée, a formal pathway bordered by rows of trees. Originally these trees were American elms, but they were replaced by disease-resistant locust trees in the twentieth century. Before the construction of the gatehouse, it is likely that this was the main approach to the house. Walk around to the right side of the house to see the Gatehouse at the bottom of the hill. 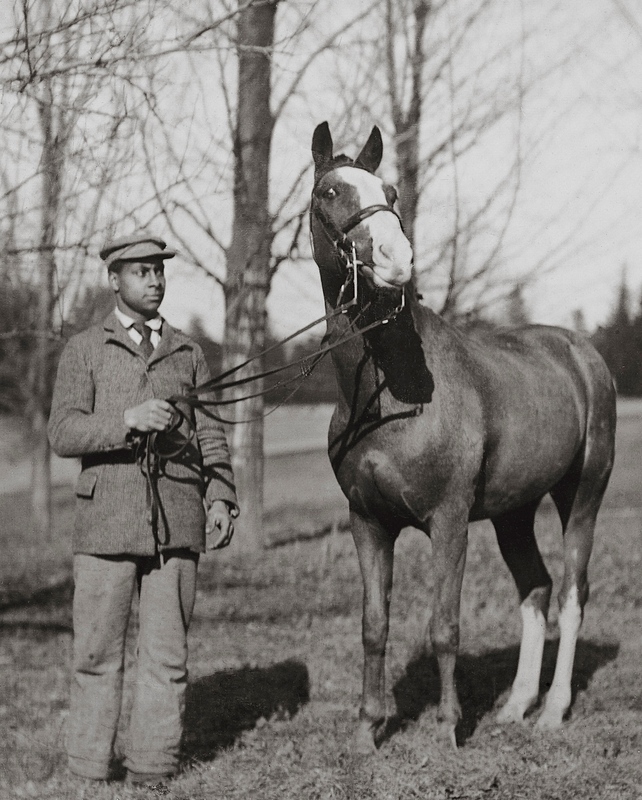 Groom on the estate, believed to be Samuel Chestnut. 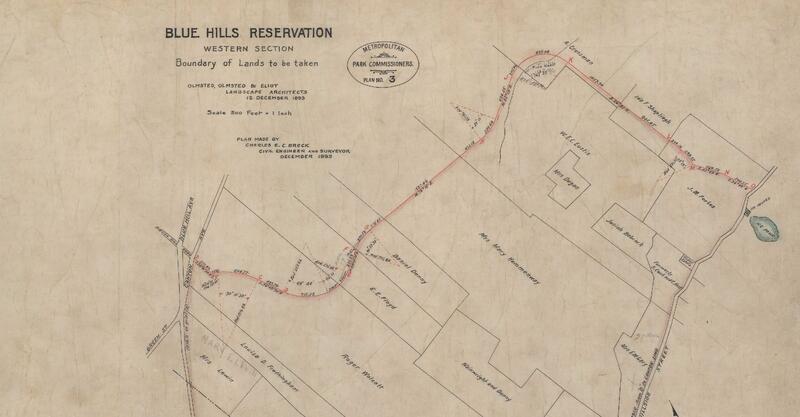 His family lived and worked on the property around the turn of the century. 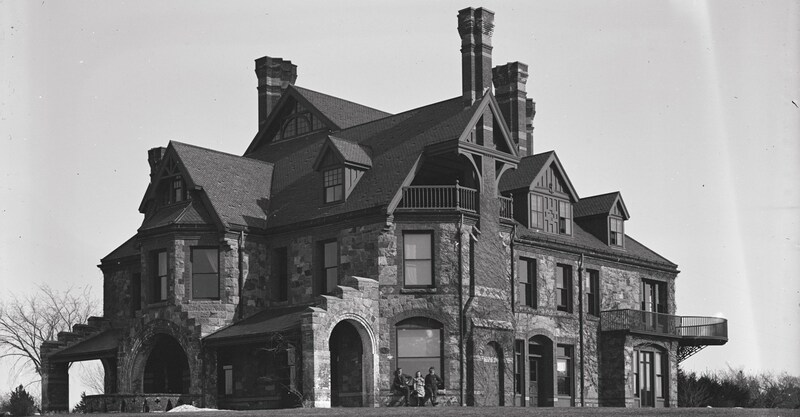 The gatehouse was built in 1892, and family history tells us that W.E.C. Eustis designed it himself. Constructed from fieldstone, the gatehouse became the new formal entrance to the estate fourteen years after the main house was built. The left side of the building served as the home for the chauffeur or groom and his family. It contained a sitting room, dining room, and kitchen on the first floor, with three bedrooms above. The space on the other side of the arch contained a carriage house and stables, which could comfortably keep eight horses. A wood-walled tack room was adjacent to the stables. 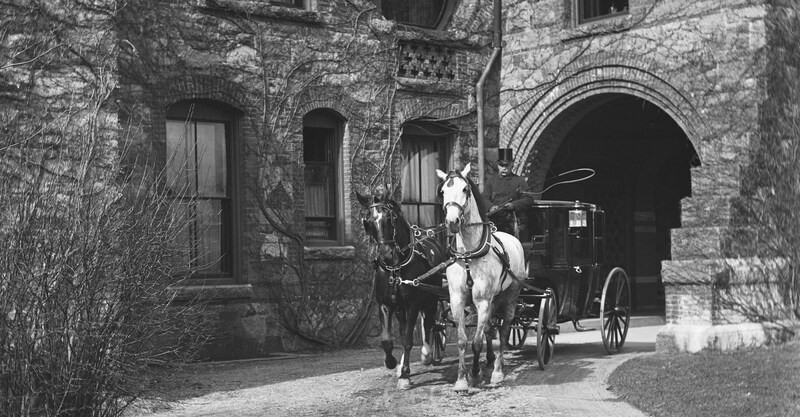 Originally, there was only a single door to the carriage house, but in 1913 the Eustises rebuilt the carriage entry to accommodate three garage doors. The building now serves as Historic New England offices. 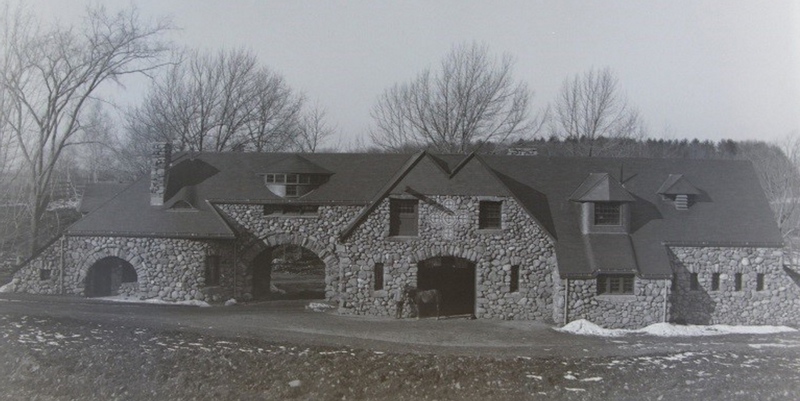 The land across Canton Avenue was once part of the estate, and the stone cow barn that survives clearly resembles other buildings on the property. It is now privately owned. W.E.C. Eustis raised several breeds of cattle on the property, and competed nationally with some of his livestock. Originally, in addition to the barn was a carpenter shop, paint shop, pipe shop, harness shop, machine shop, and a blacksmith shop, all for the maintenance of the property. 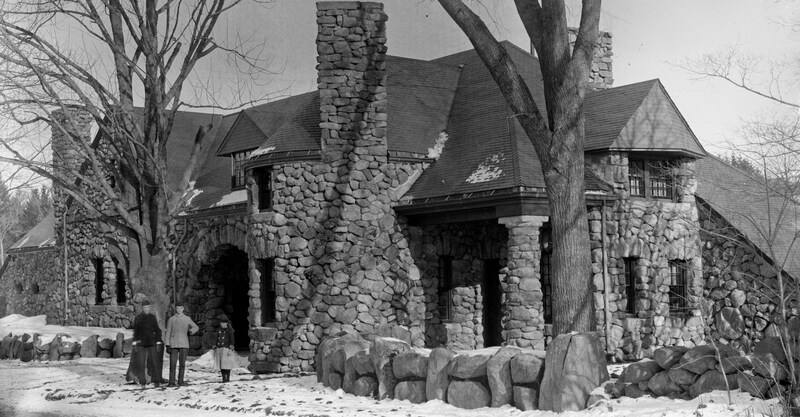 Mary, Fred, and Gus Eustis in front of the Eustis Gatehouse, photographed by W.E.C. Eustis, c.1894. Walk back toward the entry to the house, and then up the allee. Stop just before the intersection with the first road. Though little remains, the estate originally had a variety of gardens for both vegetables and flowers. The long driveway was lined with eight scalloped garden beds, each about fifty feet long. Behind the house was a flower garden with a gazebo covered in roses that was named Mary’s Garden in memory of W.E.C. Eustis’s mother. 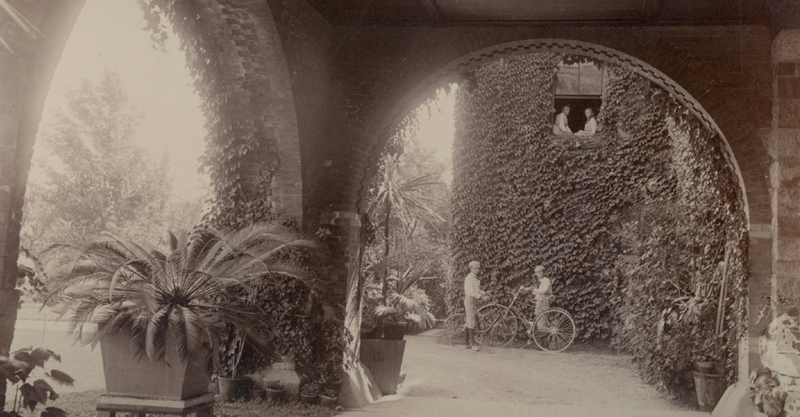 The circular garden can be seen in historic photographs like the one above and at the start of this tour. 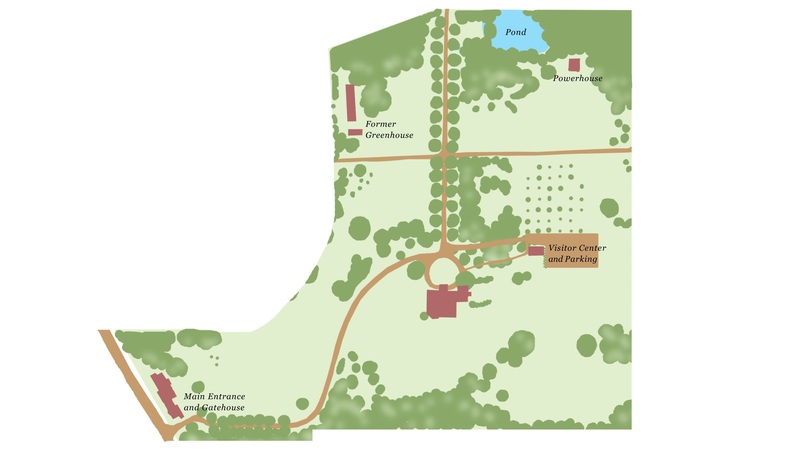 Look for it in the original landscape plan below. In 1879, the Eustises hired landscape architect Ernest Bowditch to design a formal plan for the land immediately surrounding the house. 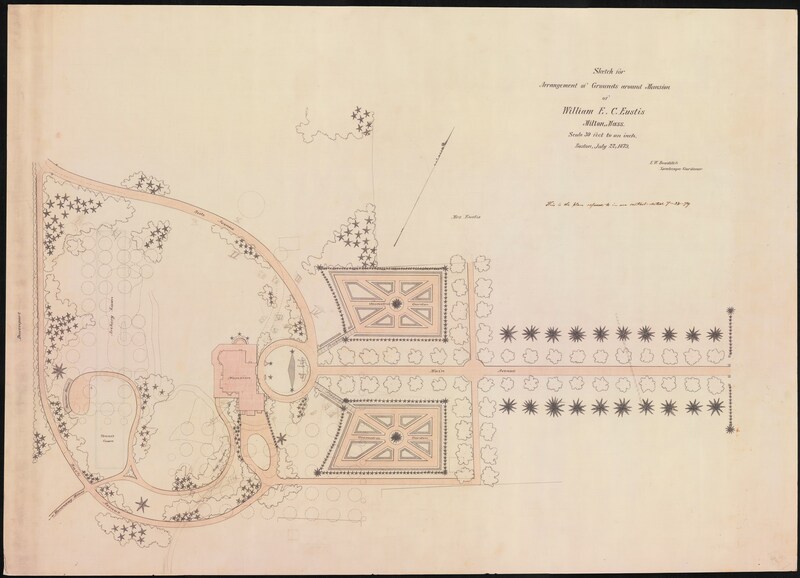 Although the basic layout of roads was built according to this plan, there is no evidence that the geometric parterre gardens flanking the allee or the summer house were ever constructed. Look down the hill toward the small wooden building with a stone chimney. 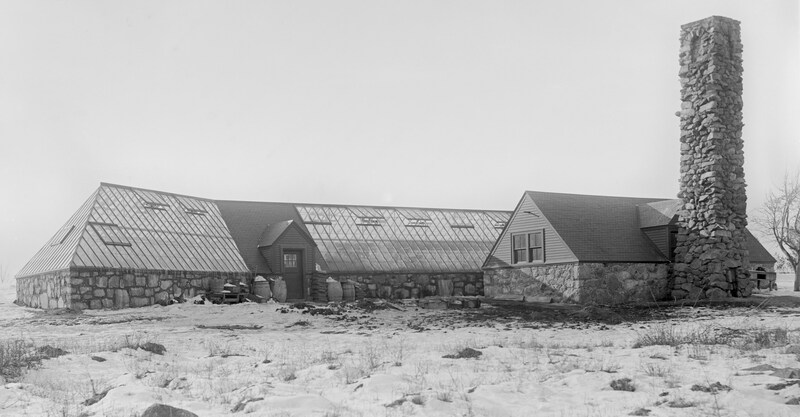 Eustis greenhouse, c.1900. The small stone building and chimney is extant. This potting shed and boiler house was originally behind a large glass greenhouse, which seasonally housed interior and exterior plants on the estate. The chimney is the last remaining part of the heating system that once warmed the greenhouse when the sun was insufficient to maintain the plants. 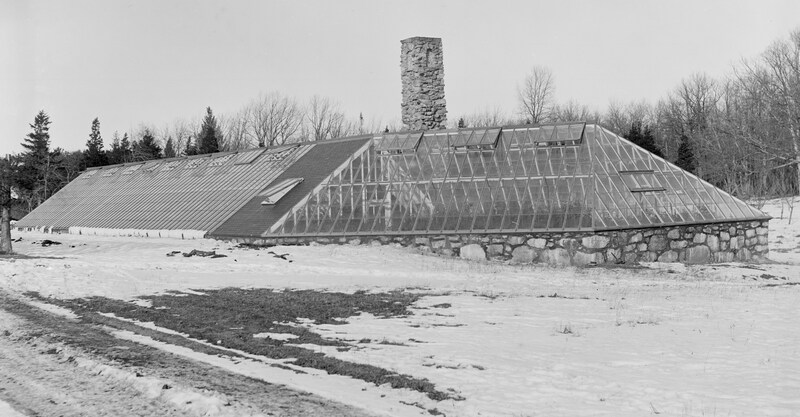 The greenhouse was taken down after World War I, when the shortage of supplies and labor made it too difficult to maintain the building. Continue down the allee and, at the clearing, walk toward the pond. Before the turn of the century, the Eustis family dammed a small creek to create a pond so that ice could be harvested at the property. Before electricity was widely available, ice was the principal method for keeping food fresh, and there was undoubtedly a large icebox in the service wing of the mansion. 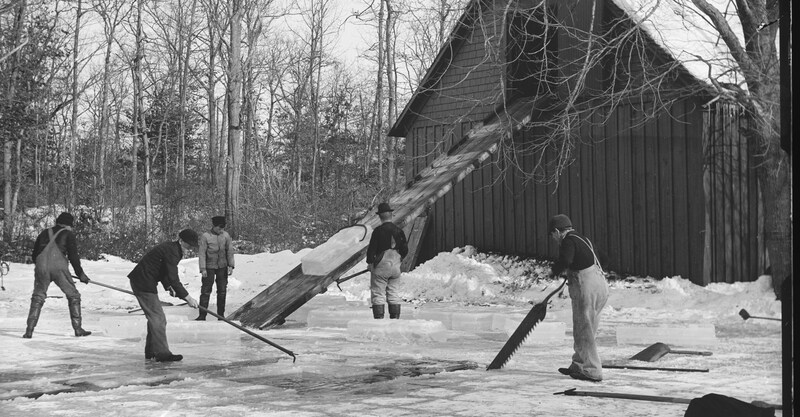 At some point, a wooden ice house was built adjacent to the pond for easy collection and storage. Today the pond is strictly ornamental. The cottage-like power house was built in 1902, as indicated in the stonework on either side of the door. As a mining engineer, W.E.C. Eustis was an early adopter of new technology, including electricity, and the construction of this building showed his commitment to the new source of energy before it was available to the residents of upper Canton Avenue. The building originally housed an electrical generator that was powered by a massive wind turbine 90 to 100 feet above it. The library was the first room connected to the new power source. Once its reliability and safety were established, the rest of the house was wired. Eventually, commercial electricity become available and the Eustises no longer needed to generate their own power. The turbine and supporting framework were removed shortly before the great hurricane of 1938. W.E.C. 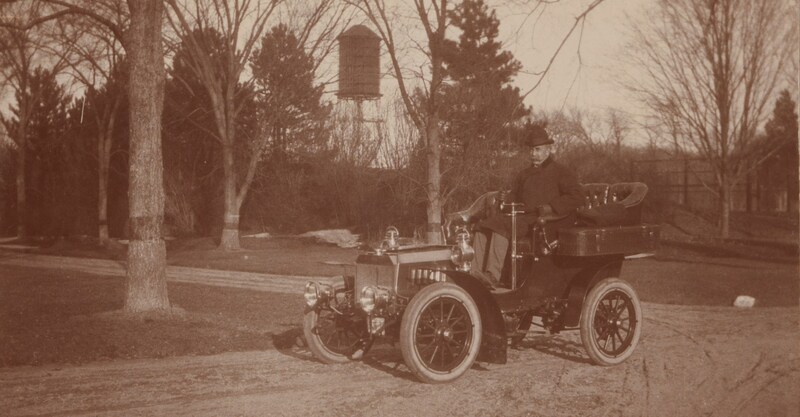 in his car, c.1905. The turbine for the power house was clearly visible from the house. The tennis court fence is also visible in the background of this photo. The strips of burlap on the tree trunks were part of a treatment against gypsy moth infestations, catching caterpillars that crawled underneath them so they could be killed. 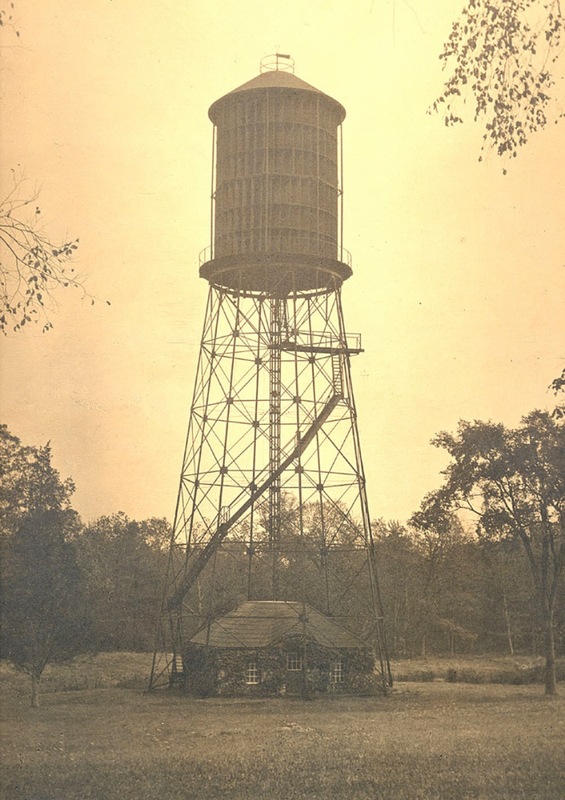 There was also a seventy-five foot tall water tower on a hill about one hundred yards from the power house; the hollow stone base is constructed in a similar style so it is likely it was built at the same time. 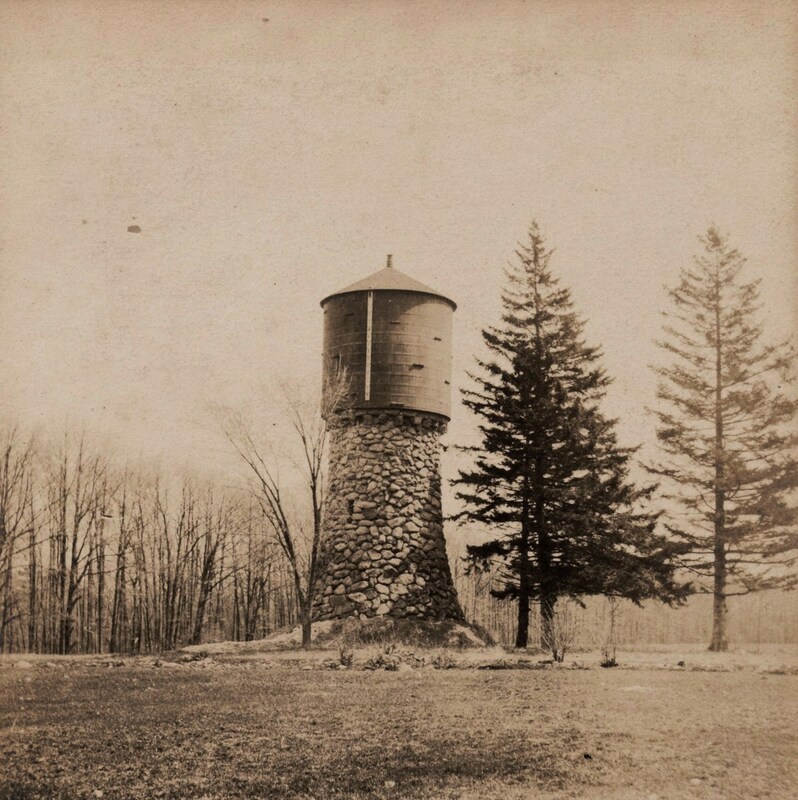 The tank stored water pumped from the ice pond by the windmill on the power house. It was then used to provide water for the farm animals, the gardens, lawns, and even the laundry. The water tank is no longer standing and it is unclear when it was removed. Continue toward the road in the direction of the house and walk to the orchard. The current apple orchard is a replacement for an earlier one, which stood in this location in the late nineteenth century. The last of the ancient apple trees were removed when the brick garage was built in the 1970s and the new orchard was established. The current varieties produced in this orchard are Macintosh, Macoun, and Red Rome. 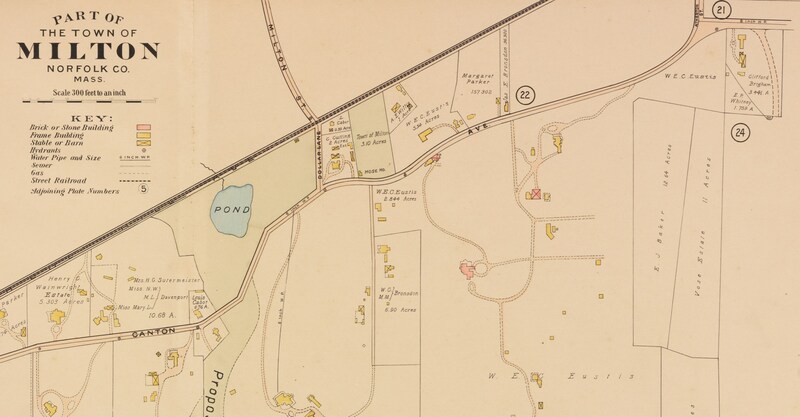 Across the road, back toward the pond, there was once a pear orchard.